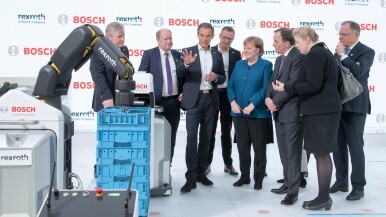 Stuttgart and Renningen, Germany – Bosch is aiming for further growth in 2018, despite the difficult economic climate. 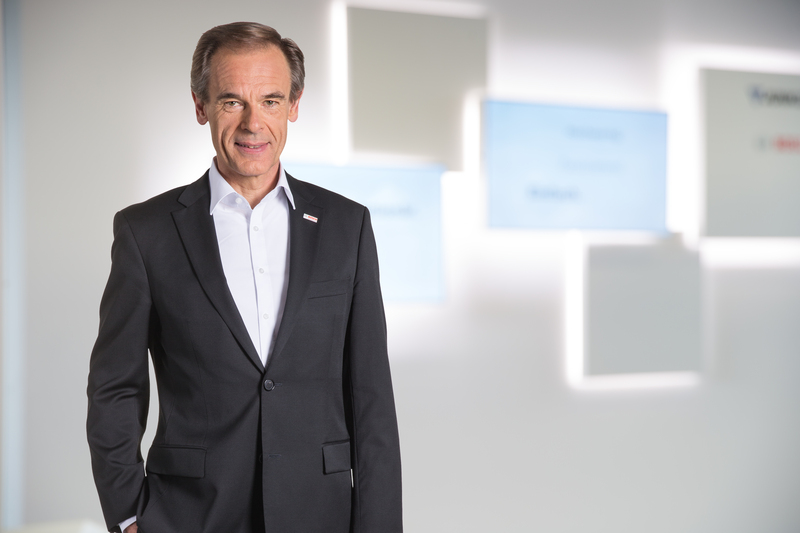 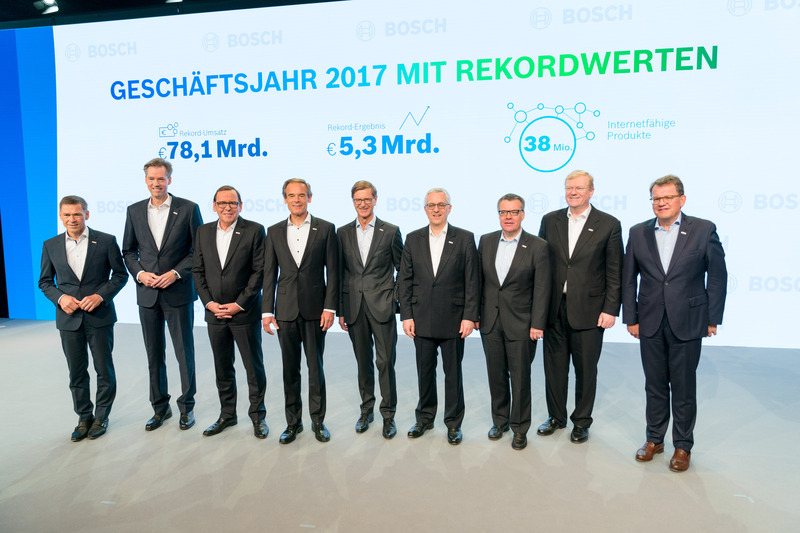 After achieving record results in 2017, and in light of economic and geopolitical risks, the Bosch Group expects its sales revenue to grow by 2 to 3 percent in 2018. 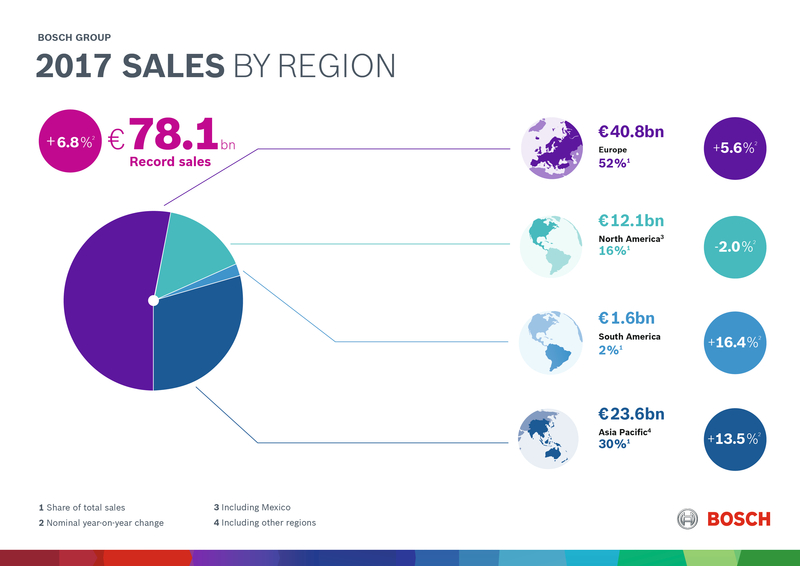 In the first three months, the sales revenue generated by the company matched the high level of the same period of the previous year, and even increased by around 5 percent when adjusted for exchange-rate effects1. 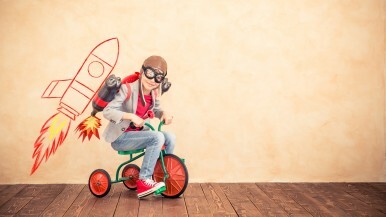 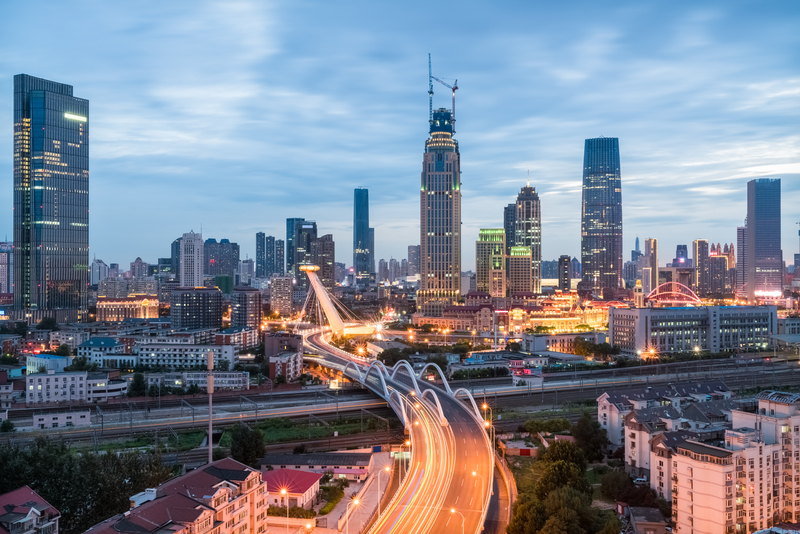 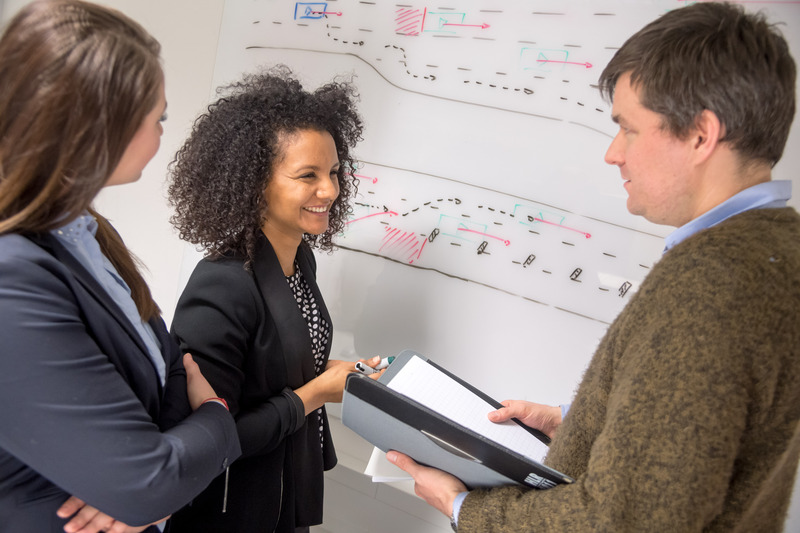 “Our company is unequaled when it comes to combining comprehensive connectivity expertise with broad industry and product know-how. 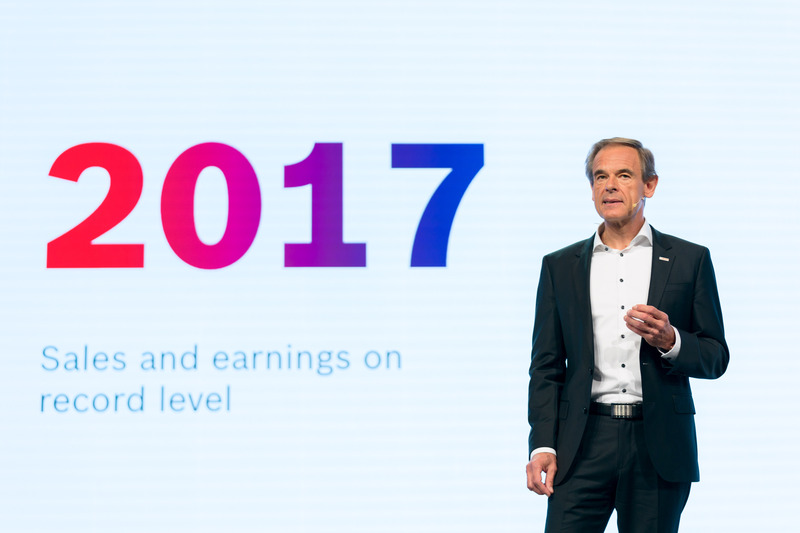 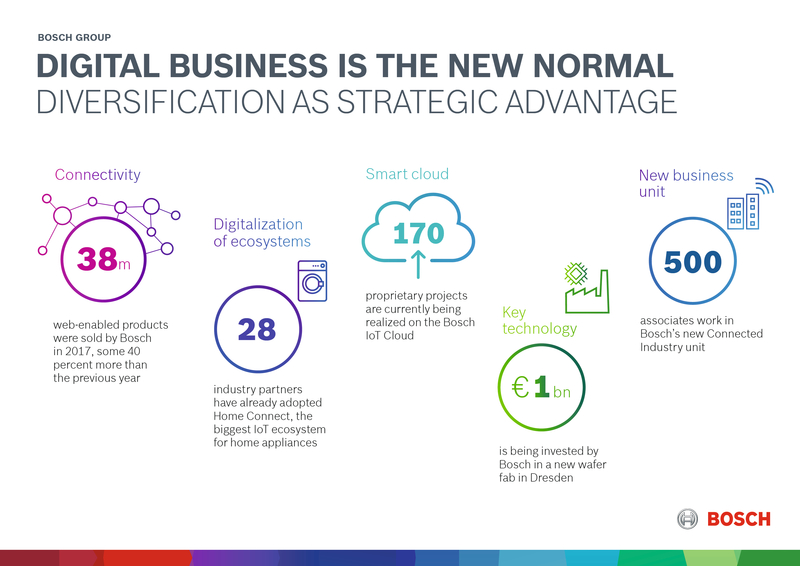 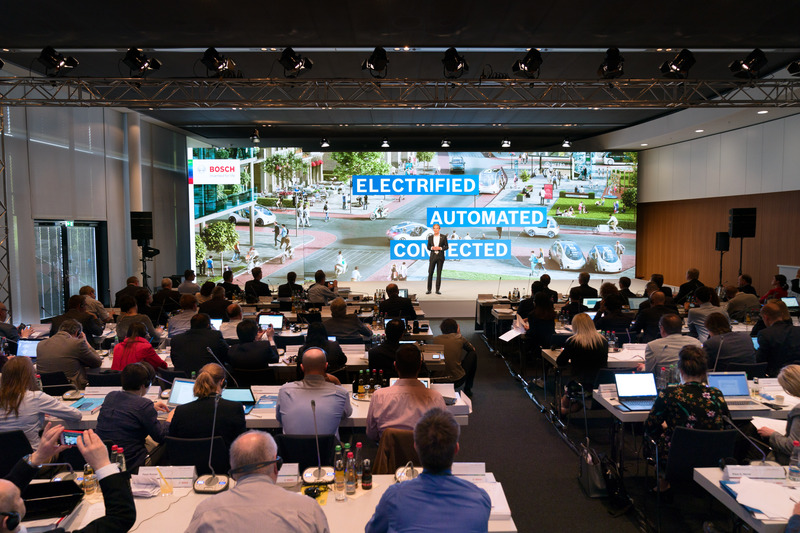 This is the Bosch Group’s unique selling proposition,” said the Bosch CEO Dr. Volkmar Denner, speaking at the annual press conference in Renningen. 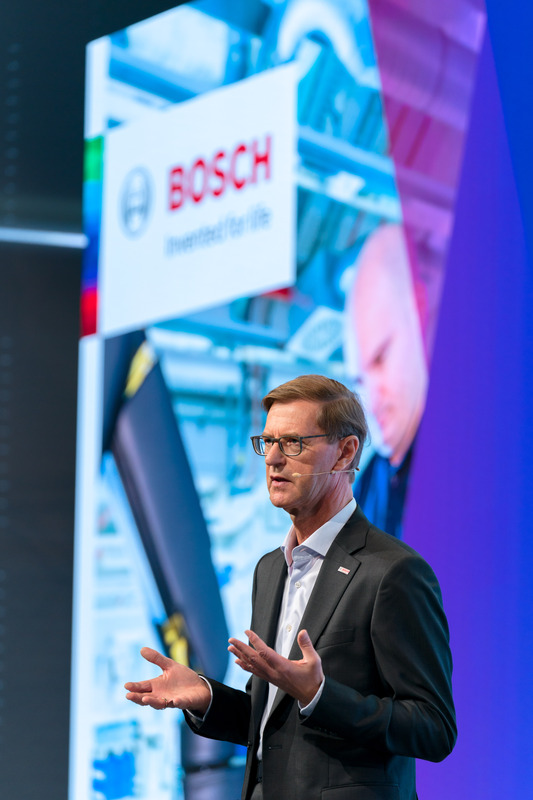 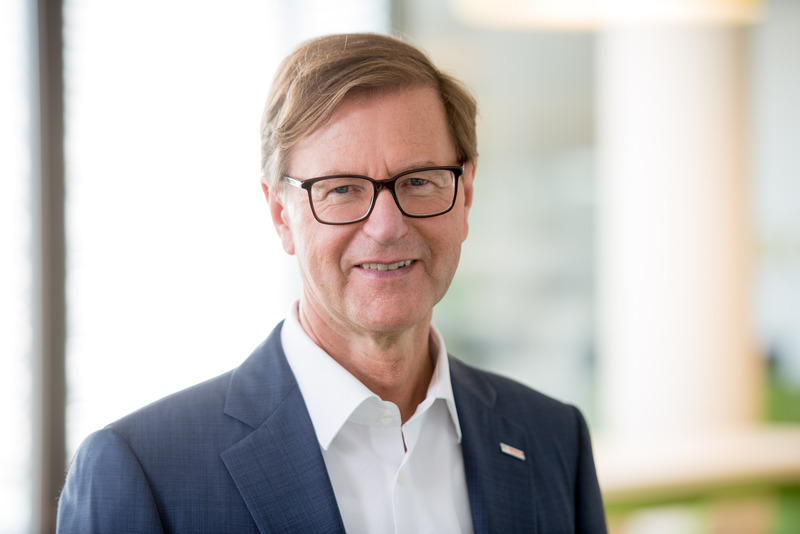 Denner sees improving the quality of life and contributing to eco- and climate-friendliness at the top of Bosch’s agenda: “Our ‘Invented for life’ ethos is our motivation for developing the best possible technologies for environmental protection. 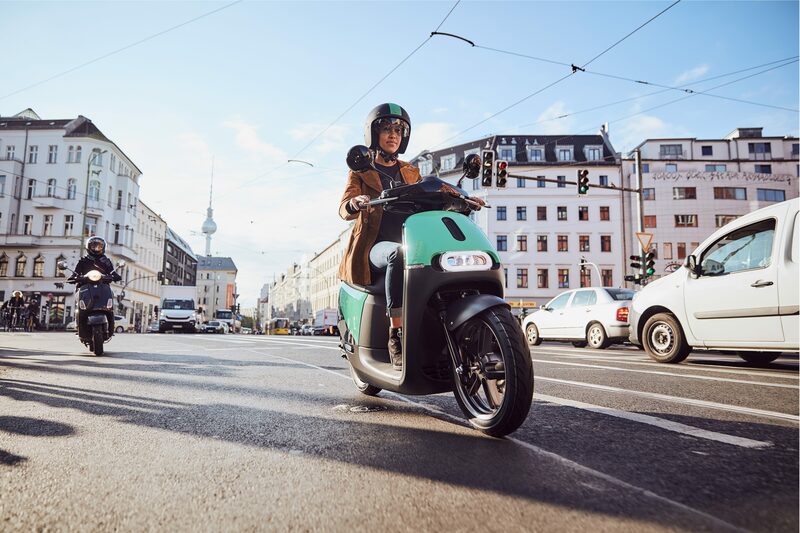 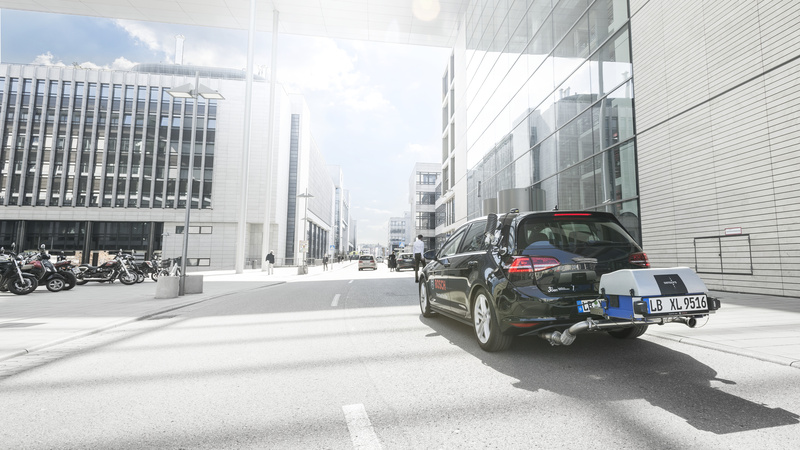 We want to help keep people mobile, while improving air quality.” To make practically zero-emissions traffic reality, the company is making heavy investments – both in making electromobility a market success and in enhancing the combustion engine. 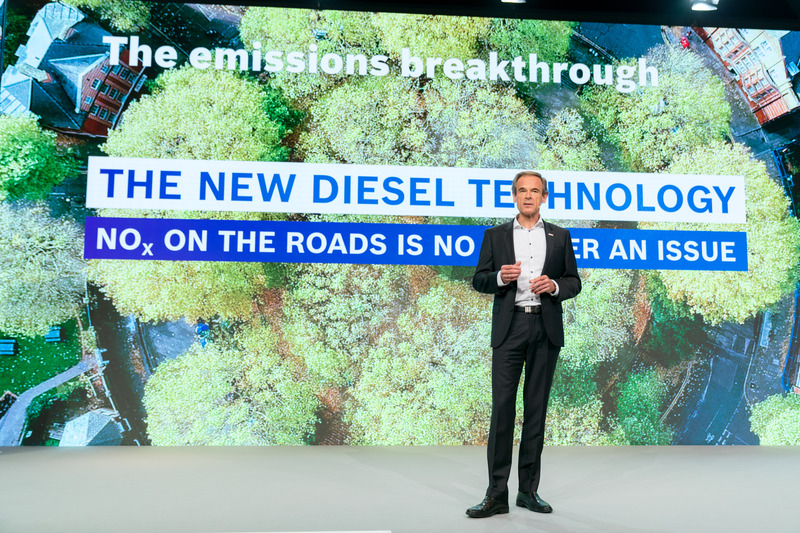 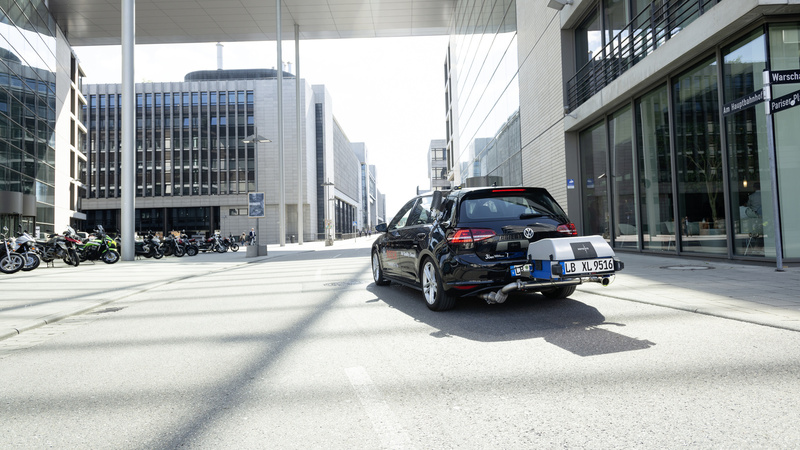 Bosch has now achieved a breakthrough in diesel technology: with their new diesel technology, Bosch engineers have succeeded in getting NOx emissions down to one-tenth of the legally permitted limit. 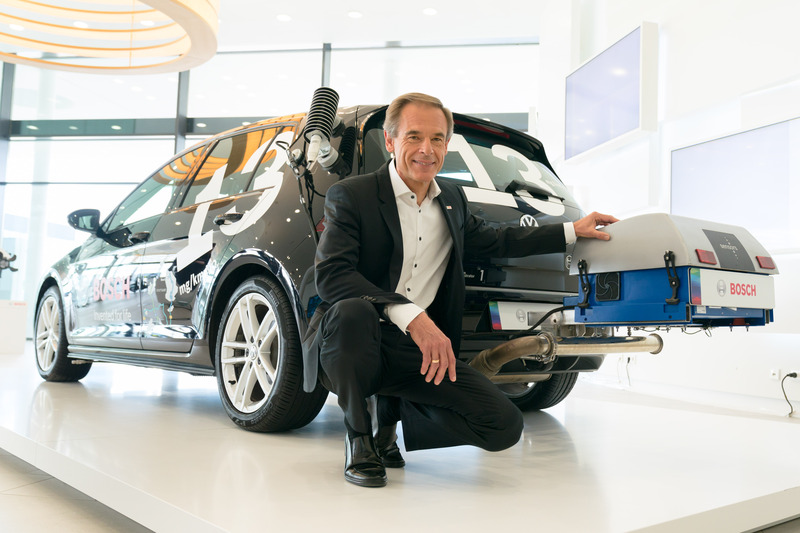 On average, test vehicles equipped with the enhanced technology already emit no more than 13 milligrams of NOx per kilometer, or far less than the 120 milligrams that will be permitted after 2020. 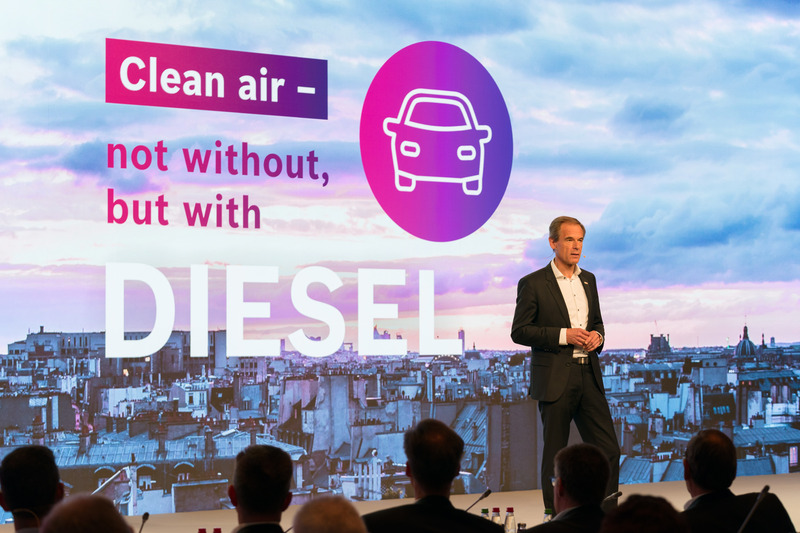 “There’s a future for diesel. 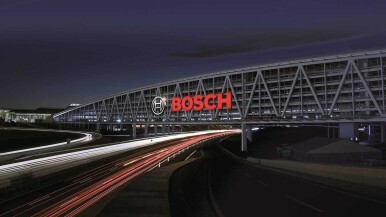 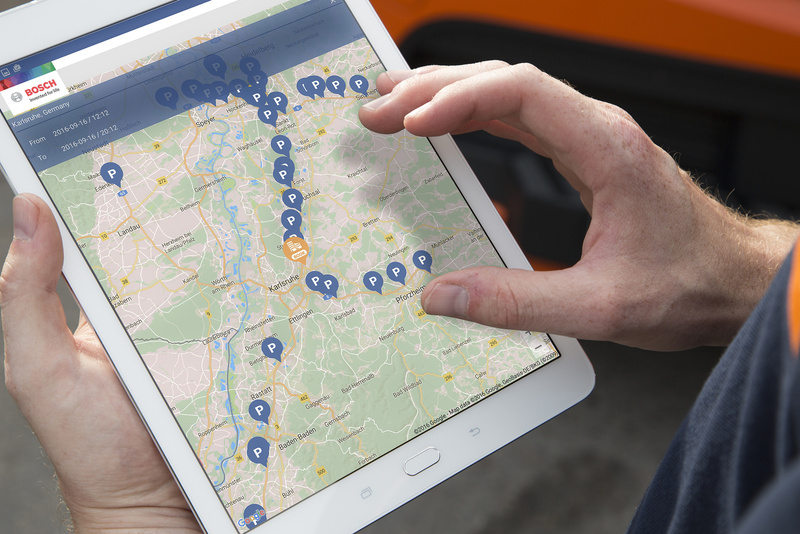 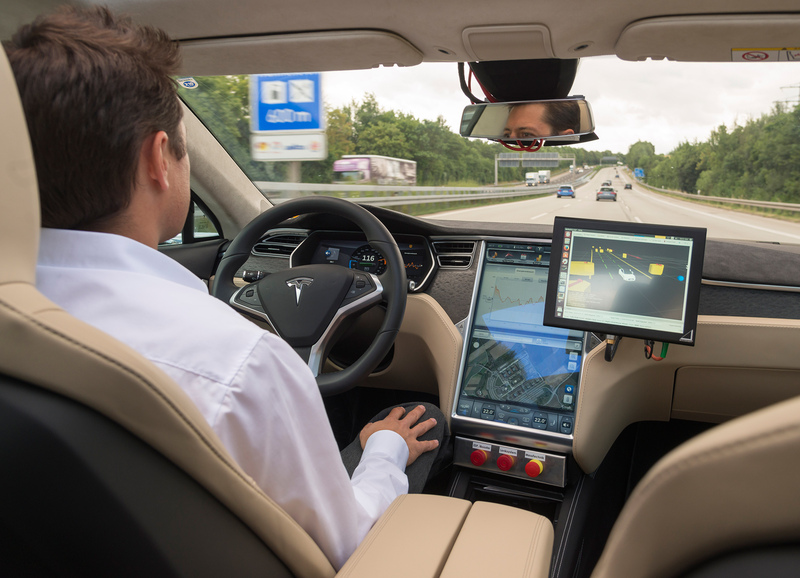 It will remain integral to tomorrow’s mobility solutions,” the Bosch CEO said. 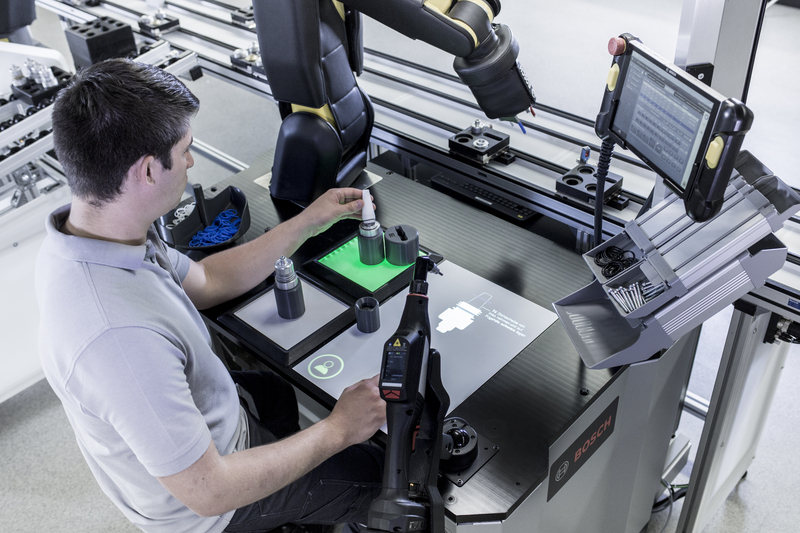 More detailed information on these technological advances can be found here . 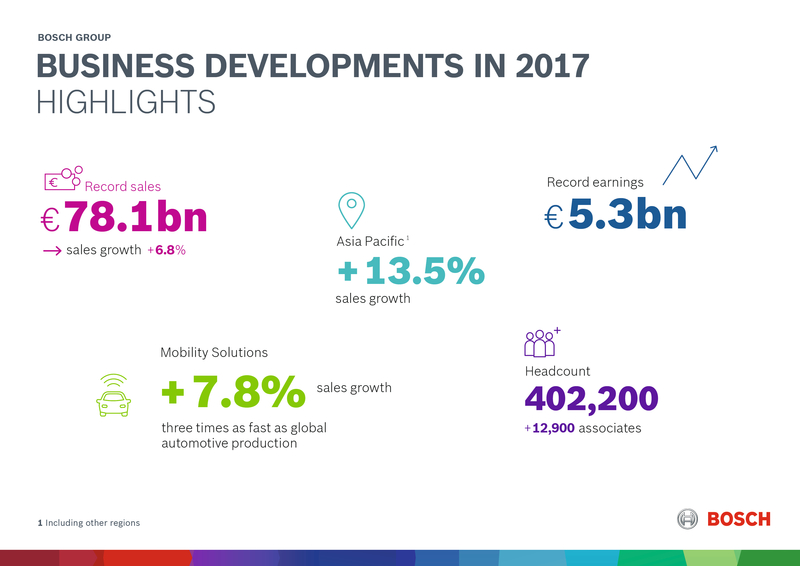 At the reporting date of December 31, 2017, the Bosch Group had around 402,000 associates worldwide. 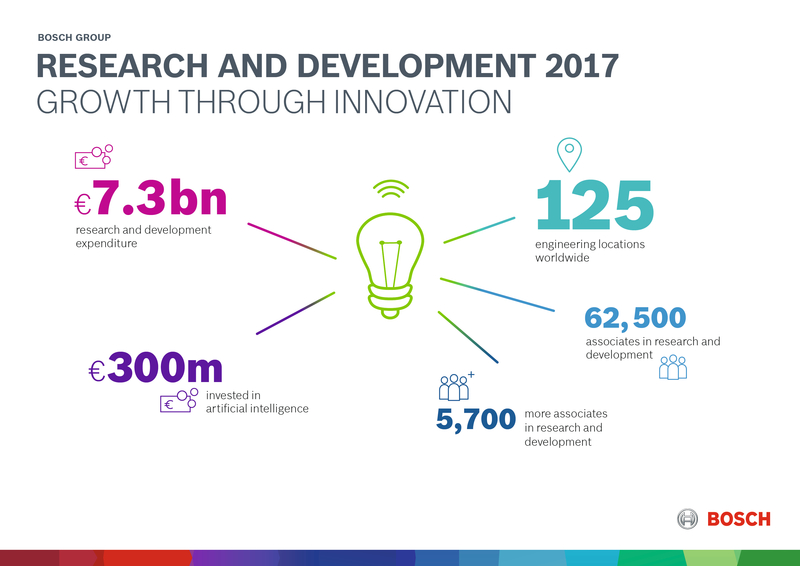 This represents a year-on-year increase of 12,900. 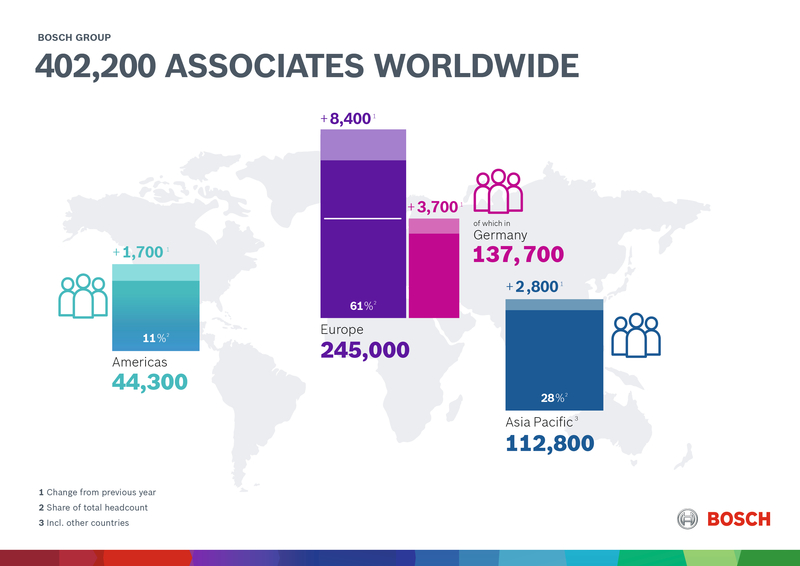 Recruitment was particularly strong in Asia Pacific and in central and eastern Europe. 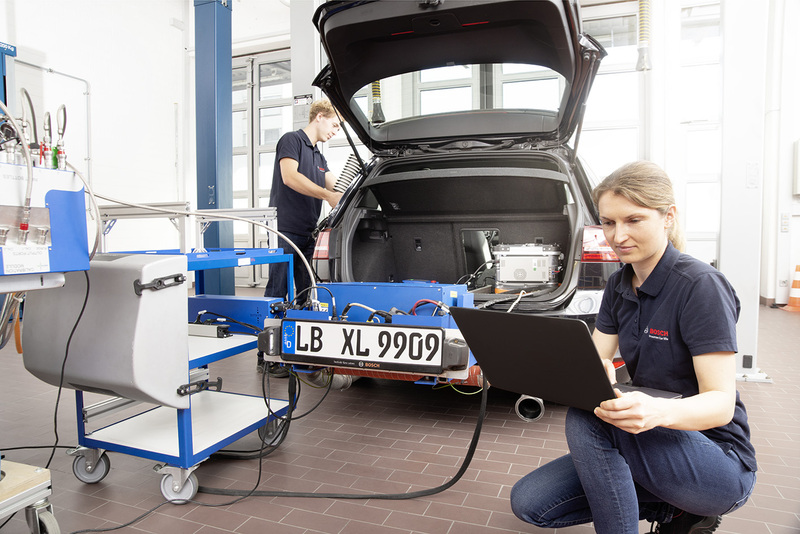 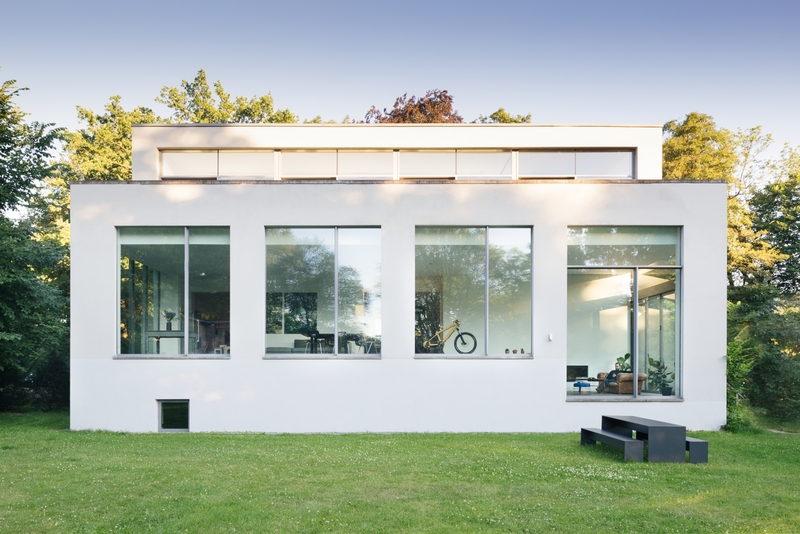 In Germany, the workforce expanded by around 3,700 to a total of 137,700 associates. 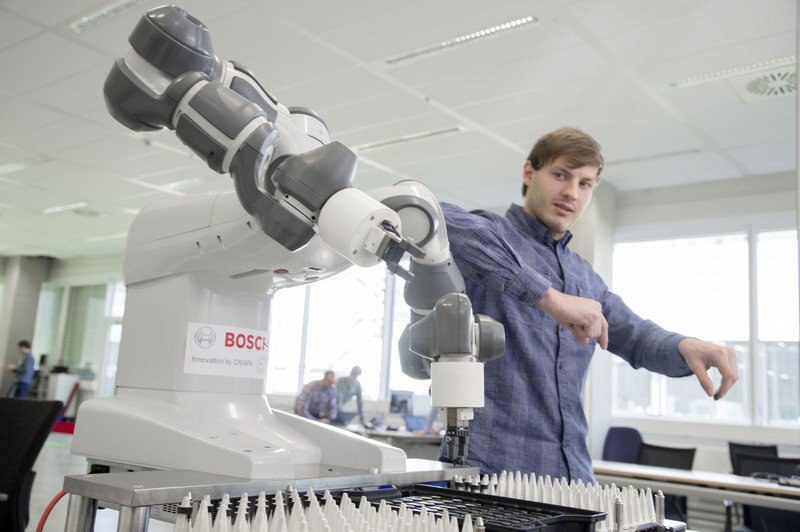 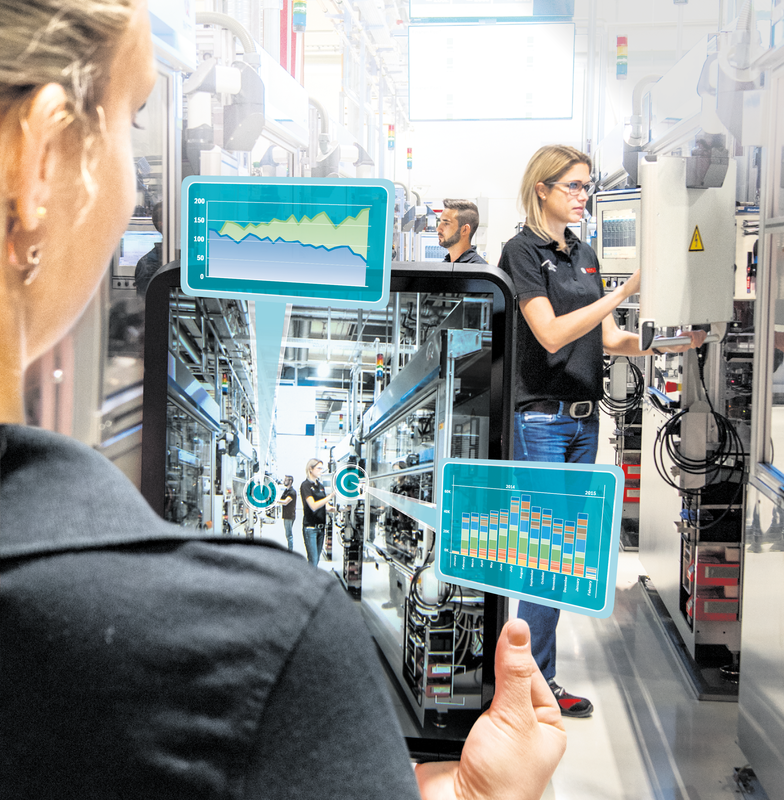 Bosch is looking to recruit more trained specialists and executives in 2018, with a special focus on IT and software engineers. 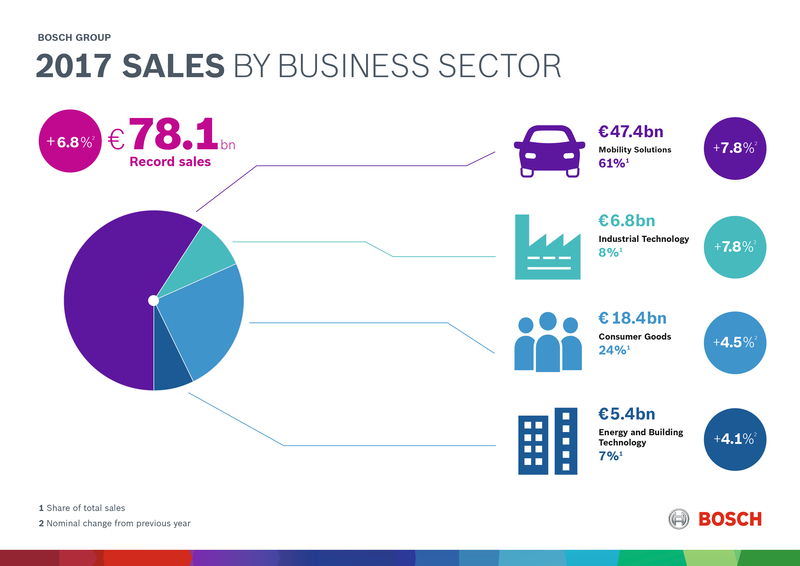 An overview of key figures can be found here. 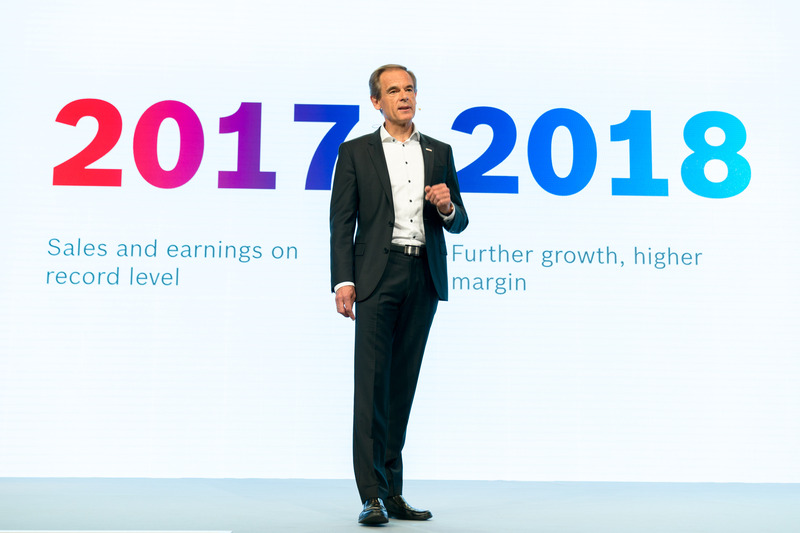 1Like-on-like calculation of sales growth based on the new consolidated group, which does not include the recently sold Starter Motors and Generators division.